HAGENAAR & ALBRECHT ARE BACK! After a two years absence, Dutch/Austrian high flyers 'Hagenaar & Albrecht' are back with vengeance for 2013 with one 'Hell' of a track! 'Love is Hell' sees them return to their distinctive 'H&A' sound, with a rock intense vocal from Aussie rocker Sarah McLeod that simply brims with attitude! Hagenaar & Albrecht’s pedigree is firmly placed in high octane main room house, with over four years experience as resident DJs for two of London’s super clubs - Ministry of Sound & Pacha London. Meeting for the first time in 2006 when M.O.S Tour Resident Patrick was invited by Alistair to be a guest DJ at Pacha London the club residents quickly connected and they decided to consolidate their experiences to form Hagenaar & Albrecht. 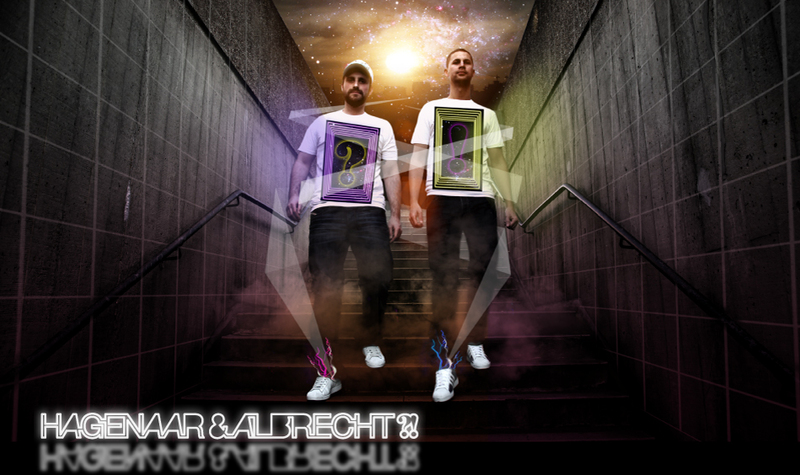 With firmly established monthly residencies in Singapore, Russia, France, US and playing for clubbing brands around the world, the duo felt the need to bring more than just a DJ set to the ever changing dance floor of the digital age and stepped into the studio for the first time to create the unmistakable Hagenaar & Albrecht sound. In 2008, they released their debut single ‘What Would We Do’ on Shapeshifter’s label - Nocturnal Groove, which went No.1 across the download sites, hitting the top 20 in the ITunes dance chart, got licensed on multiple compilations and became a dance floor destroyer for major DJ’s aross the globe. Chart topping remixes followed throughout 2009 before their follow up summer anthem - ‘In & Out’ ,a rework of the classic Adeva vocal, was released on Dutch No.1 dance label Spinnin’ Records. Receiving rave reviews across the industry and a solid favourite with the biggest names in dance including David Guetta, Roger Sanchez and Axwell the global smash brought them to the attention of major labels across the Atlantic. In early 2010, the big hitting producers were asked by one of the world’s largest record labels ‘ATLANTIC RECORDS’ to remix the forthcoming releases from ‘Wynter Gordon’, one of the hottest emerging female artists, and the 6 time Grammy award winning R&B star ‘Toni Braxton’. With their mix of Wynter Gordon – ‘Dirty Talk’ hitting the No1 spot on the US Billboard Dance chart and taking inspiration from Atlantic’s classic back catalogue, Patrick and Alistair re-worked the Ivor Novella award winning global hit ‘I Won’t Let You Down’ by Ph.D. Instantly gaining ecstatic approval from the original artist, the duo presented the track to Atlantic US, who immediately snapped up the track and signed the boys, together with Warner UK, for a multi single deal. With the boys working on new tracks, signing a remix management deal with Three Six Zero Management, running their weekly radio broadcasts (incl. Radio FG) and a continued busy tour schedule, 2011 is set to shoot the boys into the major league! © Hagenaar & Albrecht 2010-2013. Use of this site is subject to our terms & conditions.